Did you know? Next year, there is no apostles fast :) I think this year the fast for some reason has felt more trying than in years past. I guess the warm weather, the early crops, and the fact that the only ways I really know how to enjoy squash involve either cheese or meat, has made it a frustration. At this point, I have frozen 20 squash casseroles. There are still buckets of squash left to be dealt with (my husband who loves squash planted 20 plants this year). Ripe tomatoes are crying out for a nice slice of mozzarella with that balsamic vinegar. I know this is not the attitude to have, but never have I wanted a fast to end more than this season! And, we have butchered a dozen chicken in the past month! I have endured days of smelling the wonderful scent of golden chicken broth simmering on my stove before it makes its way to the freezer. Chicken had been frozen according to parts, and I can't wait to cook it. So, yes, I am over it. Please can the 29th hurry up and get here? 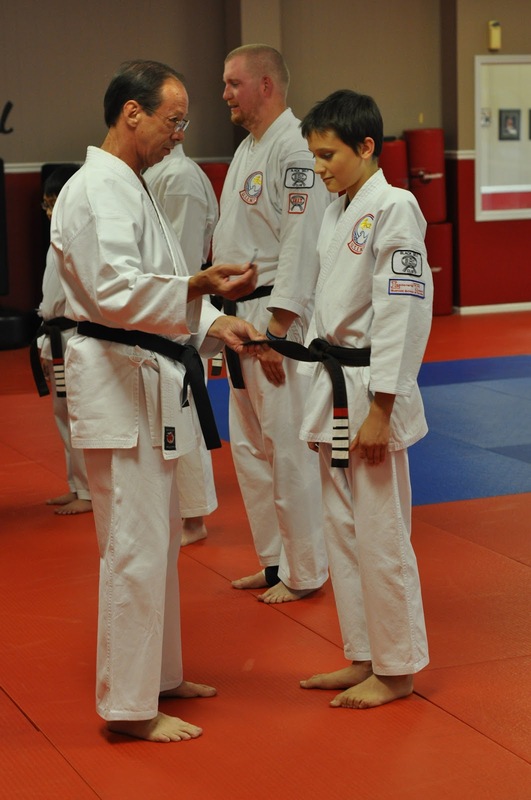 The crocodile hunter passed his exam on Friday, he is officially a second degree brown belt in Wado Ryu Karate. He is also a member of the Leadership Team now, which means he can begin to assist teaching the lower belt classes! The first completed dress! I love this pattern. The techniques for the ruffled neckline were so very simple, but nothing I have ever done before. I would have liked a third ruffle at the bottom, but I ran out of the pink fabric, this dress takes a LOT of fabric! The girls helped out in creating the flower for the headband. Can't wait to get started on another project, definitely doing skirts next. Pentecost marked the end of our second year of Catechesis of the Good Shepherd in our parish. The atrium year is scheduled to end with the day of Pentecost, and it is considered an important event for the children in the catechesis. Since we wish for the atrium to become a doorway into the spiritual and liturgical life for our children, Pentecost is the culminating celebration within the yearly liturgical cycle of time in the atrium. (250) Over the past year, we have pondered the wonders of God's creation through the power within a mustard seed, the smallest and humblest of seeds, but which becomes a magnificent tree in which the birds of the air nest. (251) With the oldest ones, I have considered the transformative nature of the grain of wheat which is sown and grows, the farmer knows not how; that seed which must first go into the ground and die, but which when it dies then grows into a plant brimming with new seeds, (252) new life. Over and over we have heard proclaimed the message of the angels, "Do not be afraid," as each time they visited and prepared others for the coming of the Light. I watched as the children stood before the Paschal candle, lighting their own candle in remembrance of their day of baptism, reminding them that (253) Christ came to share that light with each of them. We hear about the wonderful gifts of baptism; (254) light, (255) a garment of white, (256) new life by the power of the cross, (257) the oils of gladness and (258) holy chrism, which mark each of us as part of the flock of the Good Shepherd, and ultimately (259) the gift of the Holy Spirit which is given to each of us in the waters of baptism. As we moved about the room last Sunday, our rooms were full of both children and joy. We delighted in having everyone together as the Wednesday evening session kids joined the Sunday morning celebration. (260) The hum of busyness was evident, as each quickly found work, doing a surprisingly good job of moving about in rooms that now held a total of (261) 42 children rather than the normal 30 for Sunday morning! About 15 minutes into our morning, a few children wished for the Paschal candle to be lit. They each lit their own candles, and stood around the baptismal font. Before long, a crowd of six or seven children were drawn to the area, and spontaneously they began to softly sing "Christ is Risen" as they raised their candles high in the air. 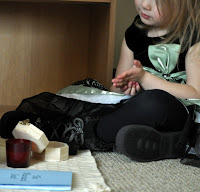 We the catechists quietly observed, as the children held their own little Paschal vigil! When it came time to gather together for our Pentecost celebration, their Paschal celebration was still ongoing. The children put out their candles and joined us. Our time together at the prayer table was marked by (262) multiple interruptions, of the most beautiful kind. In sharing the events of Pentecost, every time the catechist made the statement Christ died, and He is Risen, it was followed by joyful spontaneous responses of "He is Risen indeed, let us adore his third day resurrection," immediately followed by a singing of "Christ is Risen" - completely child initiated and led. The children heard how the disciples were afraid after Jesus ascended, and that he promised to send a Comforter. Together we listened to the words of the scripture, as the rush of wind and flames of fire descended upon them as they received the Holy Spirit. We heard how (263) when the Holy Spirit comes, people are transformed. The disciples were no longer afraid, they could now boldly proclaim the truth of the Resurrection to all, for they were filled with the Holy Spirit. When the gifts of the Holy Spirit were presented and explained, one child called out "It's just like the gifts of baptism!" And while words such as (264-270) Wisdom, Knowledge, Understanding, Counsel, Might, Fear of the Lord, and Delight may seem above the heads of these little ones, when they were allowed to come and choose a gift of the Holy Spirit they would like to receive by lighting a candle, they thoughtfully considered each of those words. Many of the boys were drawn to the gift of Might, Strength. One girl went straight to Delight, because in her words "That means joy!" One five year old stood in front of the word Counsel, and softly uttered the name of the gift as she lit her candle, then remained standing there silently gazing at that light for several minutes. They wanted to see which gifts their catechists would select. They wanted to compare, who was asking for Knowledge, which of them wanted Wisdom? When we pondered why God would want to give us these gifts, (271) they replied with comments such as "because He loves us," "because he doesn't want us to be afraid of Him," "because he wants us to know him." They wanted to sing joyfully in thanksgiving for the great Gift of the Holy Spirit. Their enthusiasm even carried over into the morning homily. When Father questioned if this day "was to be a day of fear, or a day of joy?" One 3 year old boy in the back called out in response, "a day of joy!" Our time in the atrium ends with the procession into church. Each child is given a flower to bring as their gift. It is their offering back, their thanksgiving, both to God and to the parish. (272) They are a part of this body of Christ with each of us, and they are learning how to become more a part of that body. Just home from an amazing local theater performance of "The Sound of Music"
The kids enjoyed staying up late, way past bedtime. And of course, the queen wanted to wear her hair just like Gretl! 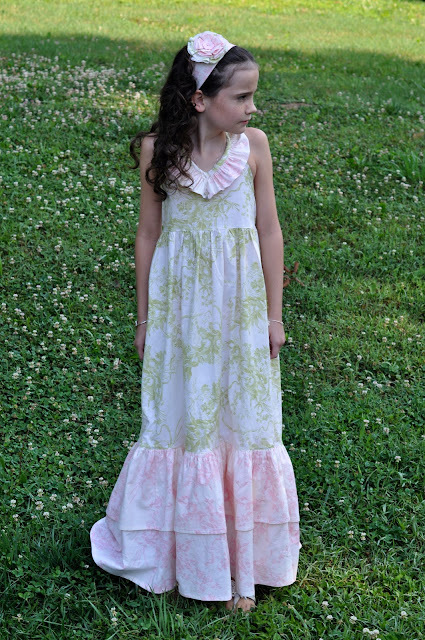 I have just discovered Violette Field Threads. Not only do they offer beautiful, girly designs and easy to follow patterns - as in step by step photo tutorial style pattern instructions - but they also satisfy the occasional need for instant gratification in sewing with downloadable patterns. I was a bit skeptical about downloading at first. All that cutting and taping of larger pattern pieces had me wondering about the hassle. But, I hate tracing off pattern sizes. With a downloadable one, no need! Sure, you have to do a little taping, but give me some cutting and taping any day over clearing a counter and meticulously tracing multiple sizes onto butcher paper or fabric facing. So, in a bit of a frenzy, I immediately downloaded 3 patterns. Only after that did I notice the nice little tab at the top labeled discount codes, where if you buy groups of patterns at a time you can get up to 20% off. Oh well, next time I guess, since there are plenty of other patterns I have my eye on! Well, it was worth it, so satisfying to print off pages of patterns. I pieced them together, printed off multiple copies to cut sizes for each girl, and now I am digging out some abandoned fabric stashes that sat hidden in a closet for the past few years. Will post the completed projects for those of you who enjoy sewing, an Emmaline for the princess (she wore it Sunday), and all those red and turquoise fabrics are destined to become a set of Hazel skirts for all three girls. After that, who knows! And if you sew and know of any other "hidden" gems in the pattern world, please leave a link to share. *I have no affiliation with this company, nor am I receiving anything from them for writing this post! I enjoy rereading books. Or at least I did, back when I had time to read books! 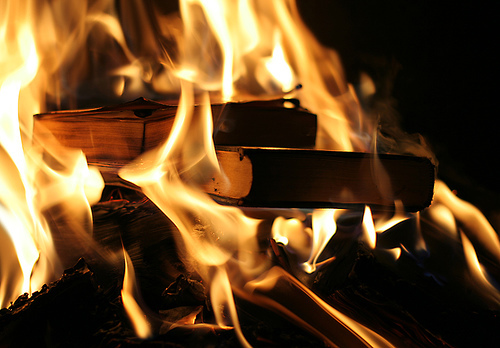 One book has held the top spot as being the most re-read book in my collection, Farenheit 451. Odd choice for a favorite re-read I know. But from the moment I was first introduced to Guy Montag to the moment I imagined a world where everyone became a walking book as the printed word vanished, I was hooked. Perhaps that is part of why I have such a hard time with technology such as the K*ndle. If ever a man saw what was coming, Bradbury did. From envisioning the advent of reality television and audience participation shows such as American Id*l to understanding how visual media would dull the mind until it could no longer appreciate good literature (just read reviews on any website for classic novels, which typically contain an abundance of complaints about how boring and difficult these books are to read), it is all there in that humble little book. Last week I pulled it out again, and handed it to the crocodile hunter to read for the first time. I have patiently waited for him to complete it so I might pick it up again. Guess now I will tip my hat to Ray Bradbury, and read it again in tribute.